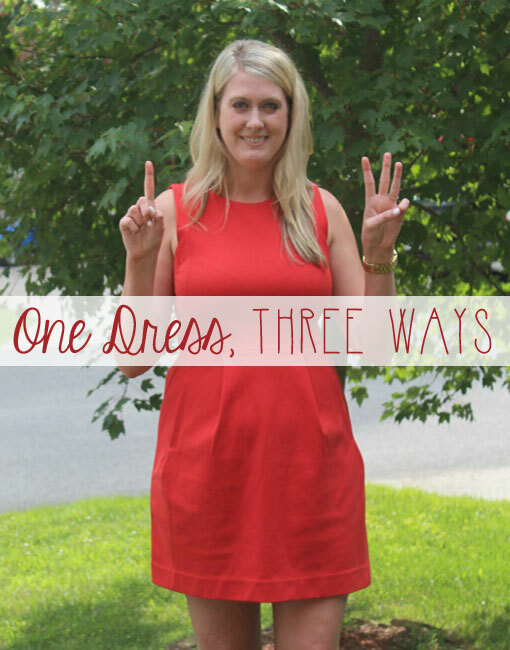 Today I have Brittany from The Lady Lawyer here to share a fun fashion post on how to wear one dress three ways! Brittany writes about all the fun things in life – fashion, food, beauty, and also her cute pups! I’m loving that she’s sharing a way to style a dress shape that almost everyone already has in their closet. Want to find out how she’s styling this little red number? Read on! I’m so excited to be guest posting today and show you one of my favorite dresses and how I make the most of it! When I find a piece that I love I find every possible way to wear it. I have been wearing this red Madewell dress on repeat since getting it. The mark of a good dress is its ability to transition into different parts of your life. The easiest way to wear this shift dress is just as it is — au naturale. All it really needs is cute pair of wedges and it can take you to brunch, church, weekend meeting, or a bridal shower. Please excuse my stank-eye this was my first time experimenting with the tripod. For a dress to last in my wardrobe it has to be work friendly. I love how just popping on a navy blazer pulls the outfit together and ready for the office. Red and navy are a match made in heaven! A black blazer or scarf would also look snazzy for the office. This summer my calendar is packed with weddings, evening work functions, and other more formal affairs. After a long day of work the last thing I want to do is put a lot of effort into an outfit. Luckily, this dress has saved me more than once and all I’ve had to do was change up my shoes and accessories! I think I’m going to get this dress in every color! What’s your favorite way to get the most mileage out of your favorite pieces? I love all three looks! Such a versatile piece to have in the closet. So true, isn’t it? Such a fun color to wear & own! I have many pieces that I can transition into different styles appropriately for the situation! I love finding staple pieces and making them work! So glad you liked it, Lindsay! I love it when one piece of clothing can be used in so many different ways! I need to work on building my wardrobe around central pieces so that I can dress them up or down more! I definitely could do a bit better with this as well. It’s always nice to have some foundational pieces that you can easily mix and match for the occasion! Love Brittany! She always has great outfits. So glad you enjoyed her post, Alanna! I always appreciate suggestions for re-working a wardrobe. Thanks for sharing! Such a great color, right? !